I don’t bake croissants very often. Not because we don’t love them (oh, how we love them!! 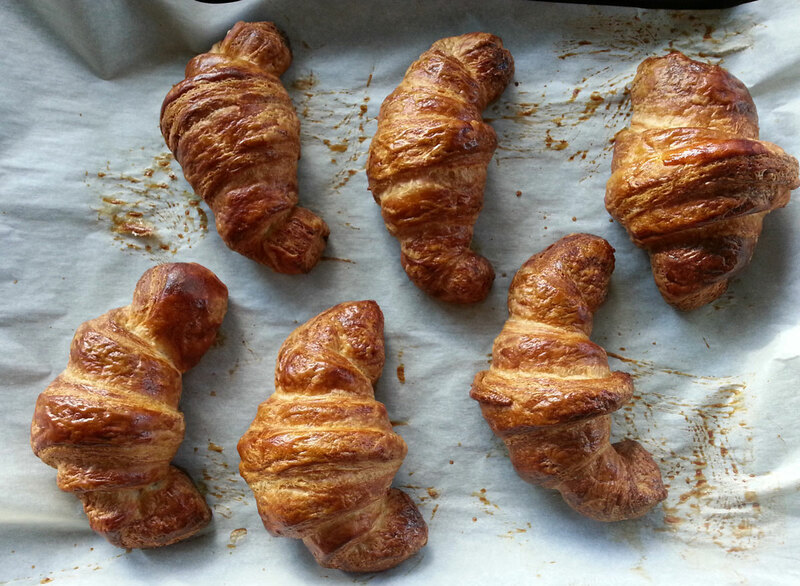 ), but because I am always trying out new recipes for our cooking school, and with just two of us eating, it’s hard to justify making a batch of croissants when I know we really can’t eat more than a few at a sitting… Freezing the rest just seems so sad! All that delicious butteriness, that perfect flakiness, FROZEN? Being a bread and pastry purist, I never freeze my desserts or breads unless I really don’t have a choice (like a sudden trip or WAY too much food in house). Unlike most people who are signing up for gym memberships and vowing to eat less in the New Year, this week we decided that New Year’s Day was the perfect time to indulge in homemade croissants, and that freezing a few uneaten croissants was better than not eating any at all. Even if the thawed croissants would be a little less perfect than the fresh-from-the-oven croissants, I would make peace with that. 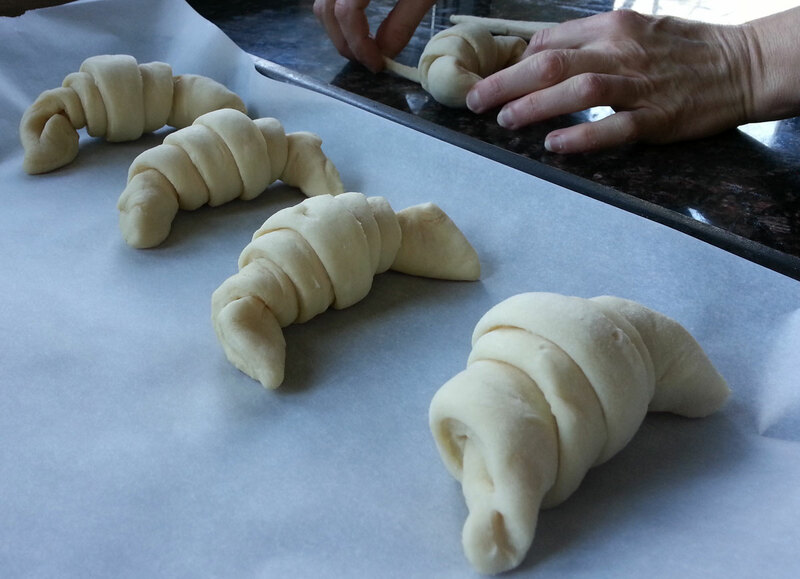 Making croissants at home is not difficult, but requires a bit of time and patience. The techniques used are drawn from bread-baking (the dough is yeasted) and puff pastry-making (the butter is layered between sheets of dough and the dough is turned repeatedly). 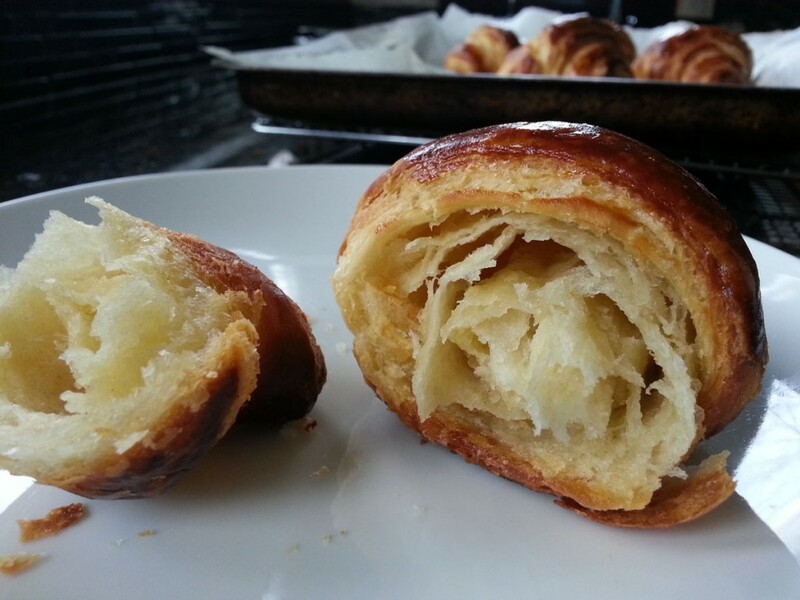 The resulting croissants (when properly made) are a beguiling combination of crisp, bread-like exterior and soft, flaky, buttery puff pastry interior. Hence, I categorized them as both bread and dessert on this blog: they are either a very rich bread or a somewhat lighter pastry… your call. For best flavor, it is absolutely essential that you use good quality, unsalted European butter rather than domestic butter. French, Italian, and Danish butters all work well (they have a higher fat content than American butters and a deeper, creamier flavor). We tasted several imported and European-style butters last year, and determined that Lescure from France was our favorite brand. So before making croissants, seek out a good European butter; it will make a huge difference. One more thing: All of the recipes (with just one exception) I have ever seen for croissants call for the dough to be made with milk. I have made croissants with both water and milk and we have decided that the flavor of the butter is more pronounced when water is used. Feel free to try milk, or half milk and half water, instead of water as below, and see what you think. 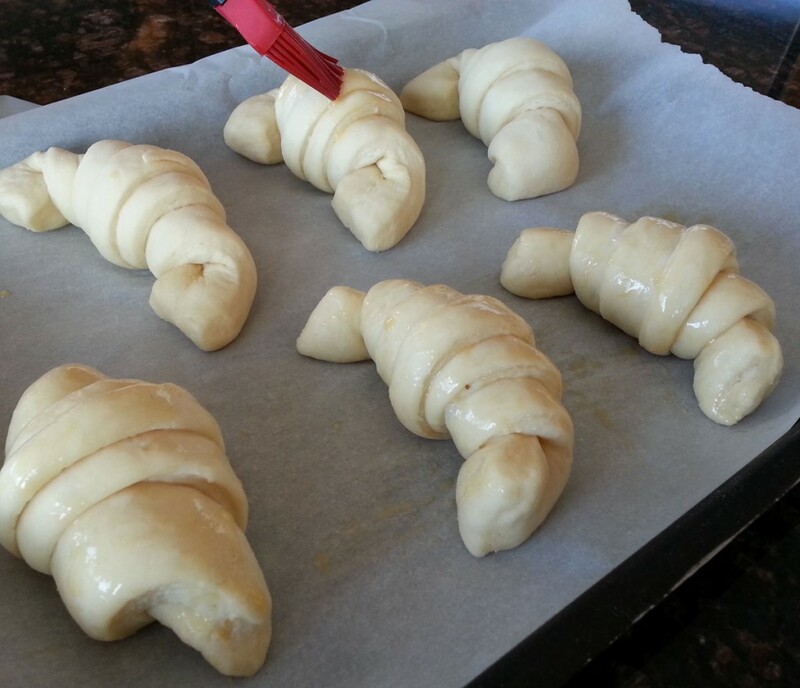 Milk croissants will brown more quickly in the oven, due to the sugars in the milk. 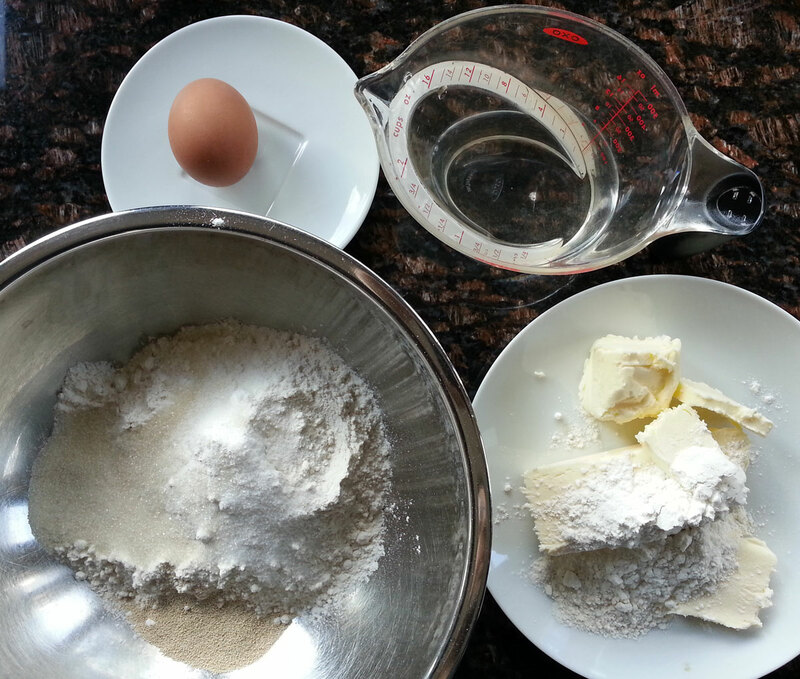 Make the dough: Mix the flour, salt, sugar, and yeast in a large bowl. 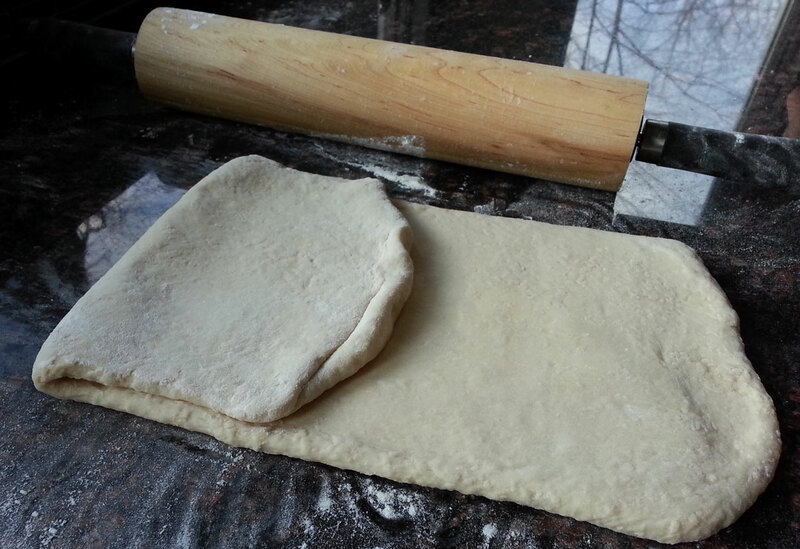 Pour in the water and mix quickly until you have a soft, sticky dough; the dough will be ragged and not smooth. Don’t overmix or the dough will be tough; 1 minute is long enough. You don’t need to knead the dough, just gather it together. Place in a buttered bowl, turn to coat lightly with the butter, and cover with plastic wrap. Refrigerate at least 4 hours (but no more than 12 hours), as the dough is easier to handle when cold. Make the butter paste: Pour the flour on a counter and place the chilled butter on top of the flour. Using a metal pastry cutter or dough scraper and working quickly to avoid melting the butter, cube the butter and incorporate it with the flour; be sure to avoid touching the butter directly with your hands or the butter will melt. Use the scraper to break up the butter into tiny pieces; any hard lumps will ruin the texture of the dough and force it to tear. When the butter is soft but not melted, there are no lumps or hard bits remaining, and it is uniformly mixed with the flour, shape it into a 5-inch square. Refrigerate at least 1 hour. Remove the chilled dough from the refrigerator and place it on a lightly floured counter. Do not knead it or work it, or it will toughen. 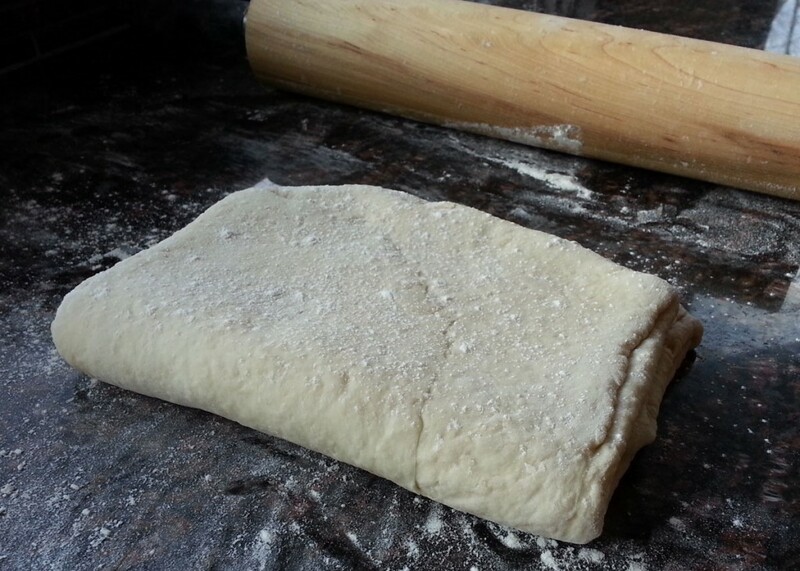 Using a rolling pin, roll it into a 12-inch square. Place the butter on the central portion of the dough at a 45 degree angle so it looks like a diamond on top of a square. Fold the corners of the dough over to enclose the butter perfectly: you will now have a diamond-shaped package of dough encasing butter. If needed, wet your fingertips lightly with water to help seal the edges properly. No butter should be visible or oozing out of the dough package. Turn the dough diamond so it sits like a square on the floured counter. Flip it upside down so the seam is underneath. 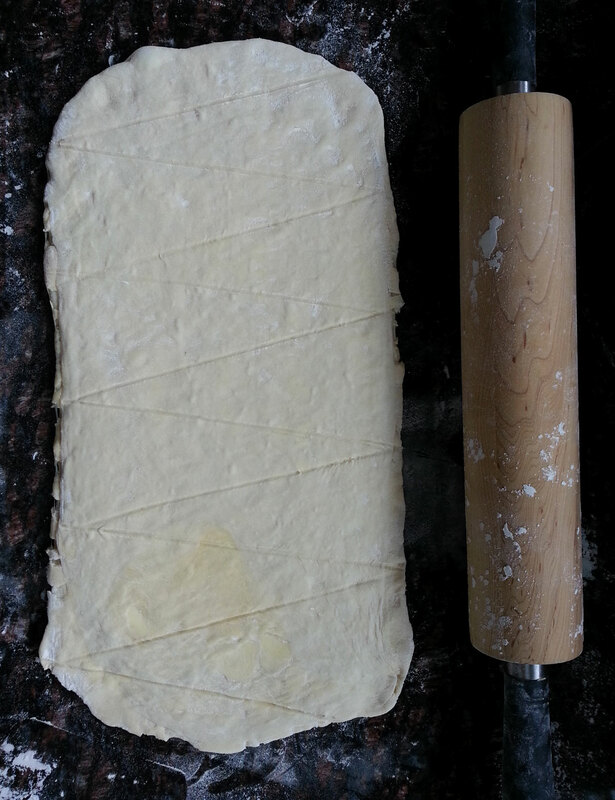 Using the rolling pin and working quickly so as not to melt the butter, roll out the dough into a 1/4-thick rectangle, about 20 inches long by about 4 inches wide. Flip the dough over a few times as needed to prevent sticking to the counter and dust lightly with flour as needed. 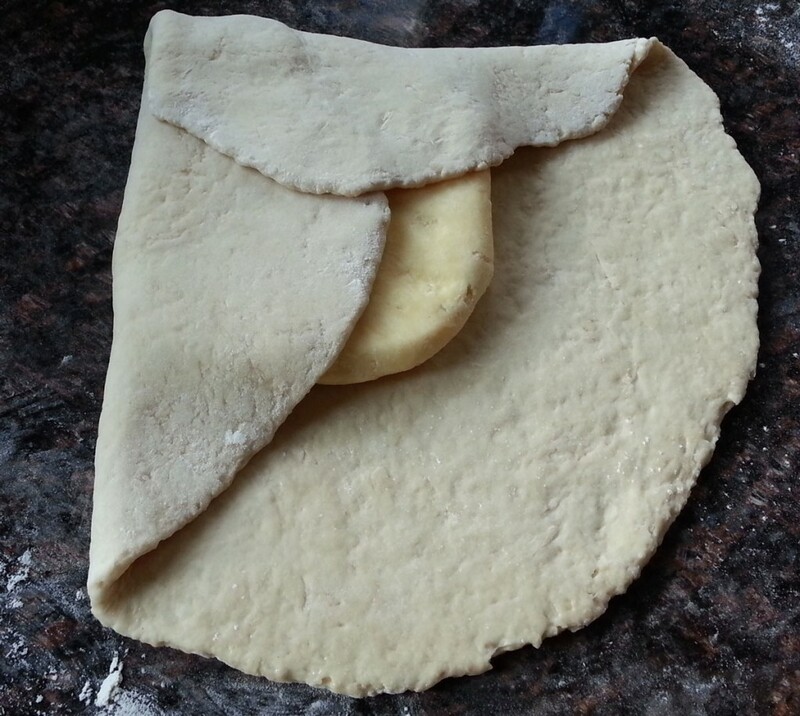 Fold the left third of the dough towards the center and then flip the right third of the dough over, to cover. 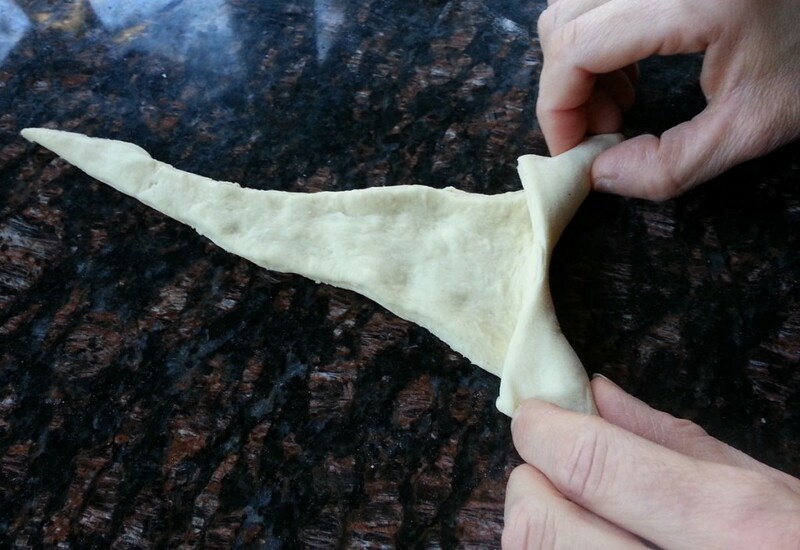 Make sure the edges line up nicely and brush off excess flour with a dry pastry brush. 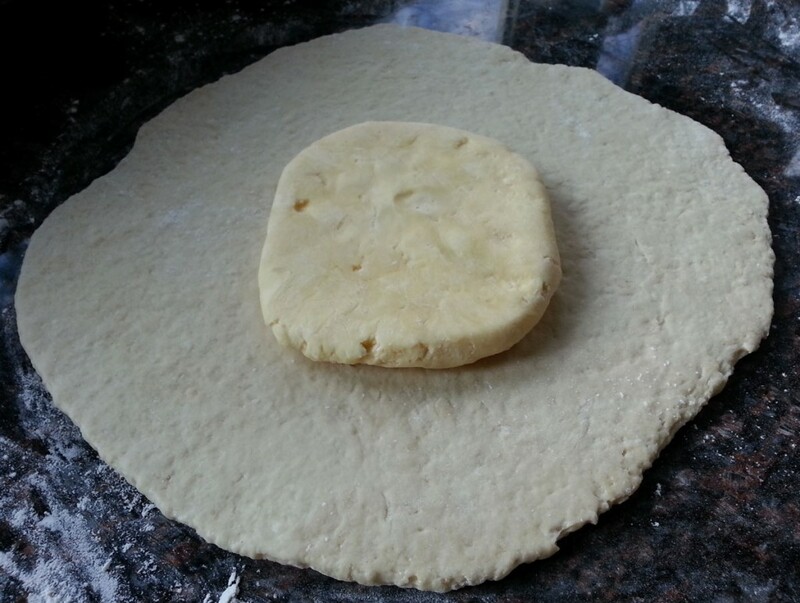 To ensure a proper texture and plenty of puff, do not roll the rolling pin beyond the edges of the dough, or you will inadvertently seal the layers together and crush them, preventing proper puffing. Turn the package 90 degrees so the spine (the closed edge) of the dough sits at the left. Roll out again into a 1/4-thick rectangle, about 20 inches long by about 4 inches wide. Fold again into thirds as before, then wrap the resulting rectangle in plastic wrap and refrigerate at least 2 hours (or up to 8 hours). The dough has now been turned twice and has 9 butter and flour layers. 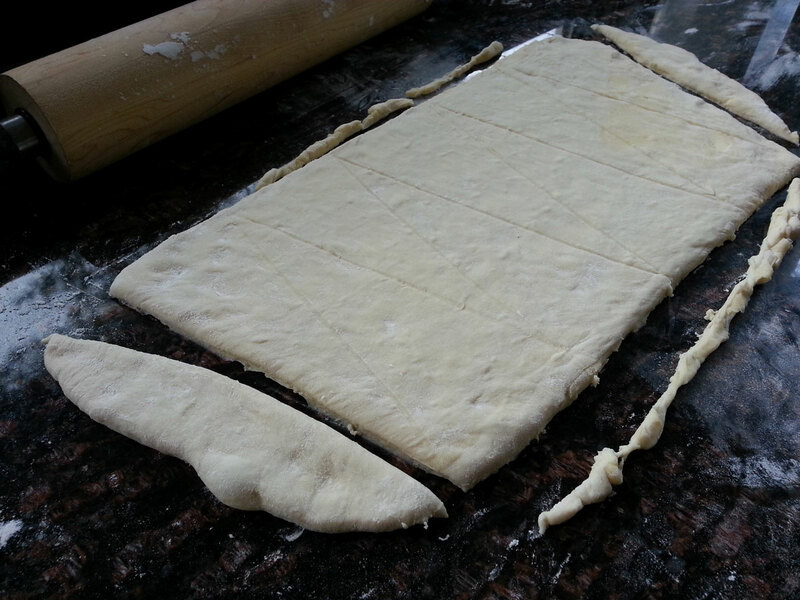 Place the rectangle of dough on the counter so that the spine of the dough sits at the left. Repeat the rolling out and folding process two more times, for a total of 4 turns. The dough now has 81 layers of butter and flour. Wrap the resulting rectangle in plastic wrap and refrigerate at least 4 hours, or as long as overnight. To bake: Remove the dough from the refrigerator. Lightly dust a counter with flour and roll out the dough into a rectangle that measures about 21 inches x 7 inches; it should be 1/4-inch thick. Working quickly so the butter does not melt, trim the edges as needed (use the trimmings to make other pastries, such as almond croissants, as below) and cut into 10 triangles (to make 6 larger croissants, cut into larger triangles). Dust off excess flour with a clean, dry brush. 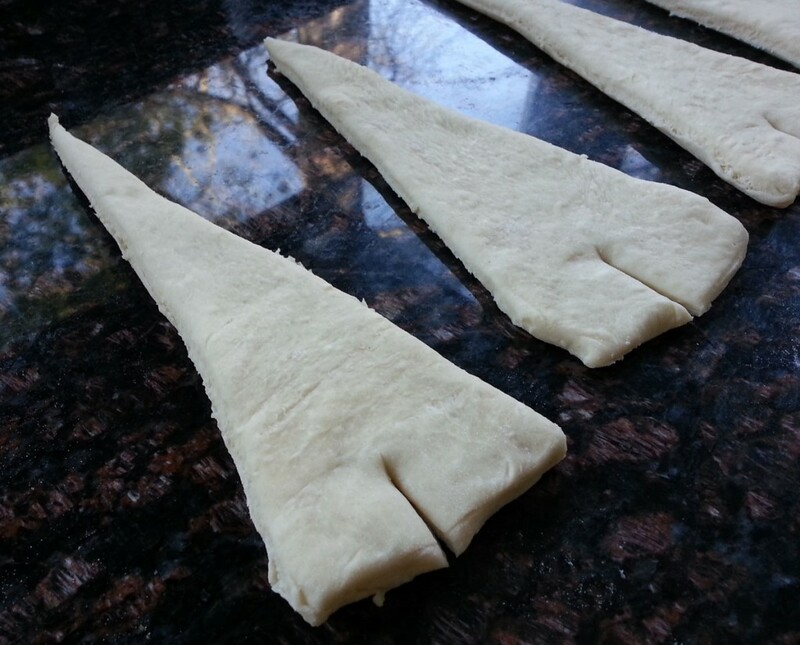 Cut a small slit in the middle at the base of each triangle; this will help you get a better curvature to the finished croissants and will allow you to elongate the corners. Gently stretch each triangle, especially at the base and tip. Roll each triangle, starting from the wide end and working towards the point, into a log, keeping the layers tight. Fold the two corners down to create a crescent shape. Place the croissants on a parchment paper-lined baking sheet, about 2 inches apart (they will rise dramatically in the oven so they need room to expand, or they will bake up pale and soft instead of golden and crisp if they are overcrowded). Cover with plastic wrap and let rest at room temperature at least 2 hours, or until the croissants are almost doubled in bulk. If your kitchen is cold, the dough will rise more slowly; don’t rush the proofing step or the croissants will end up heavy rather than feather-light. 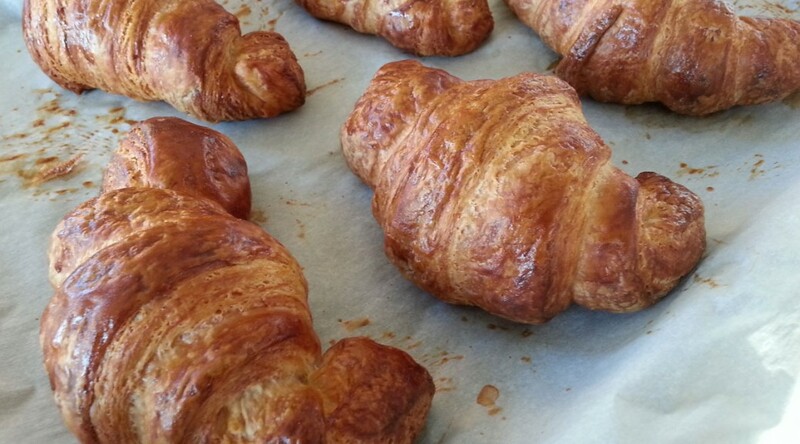 When the croissants are noticeably bigger, brush with the egg wash. Meanwhile, preheat the oven to 325 degrees convection. Bake in the preheated oven for 25 minutes, or until golden all over and crisp; if underbaked, the croissants will be soggy in the center. Remove to a cooling rack. Enjoy within minutes of baking if possible (or at the very least, within hours). 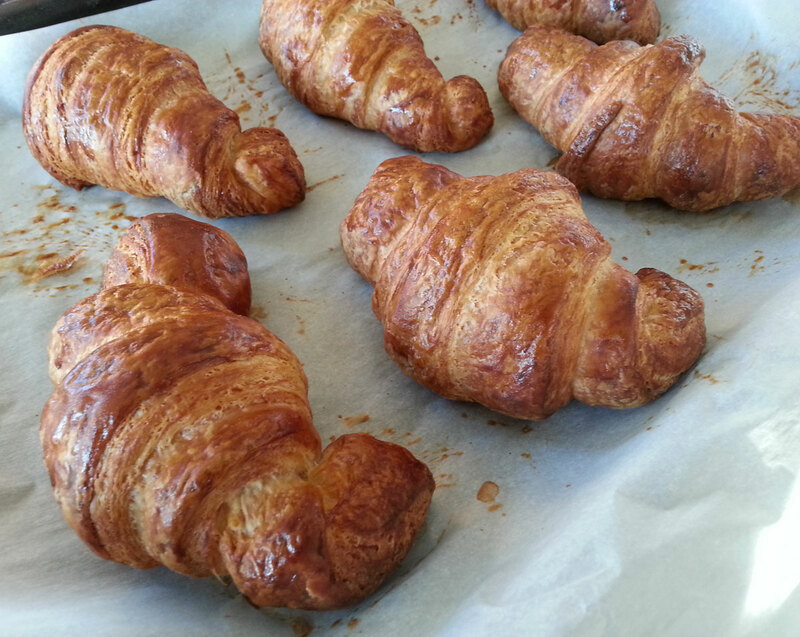 Croissants can also be frozen once cooled, double-wrapped in plastic wrap and then sealed in freezer-safe plastic bags; to reheat, remove the plastic wrap, place on a baking sheet, and bake in a preheated 325 degree oven for 12 to 15 minutes, or until defrosted all the way through and crisp. 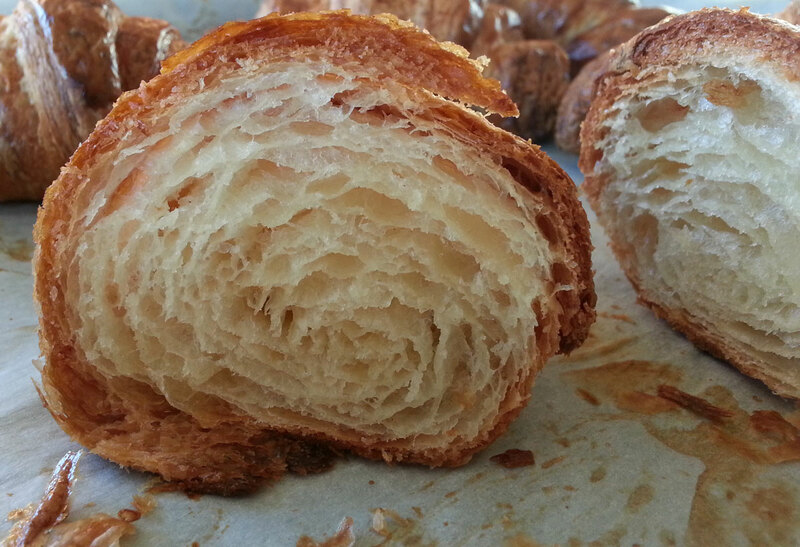 Take a look at the two photos below: one batch of croissants was left to proof until doubled in bulk before baking, and another was proofed just until the croissants grew about 50% of their original volume. The difference in the lightness of the layers is amazing once baked: the top photo (fully proofed) shows light, flaky, distinct layers, while the bottom photo (underproofed) shows undistinct, cakey, thick layers. And remember the leftover scraps and dough trimmings? Gather them gently, roll out into rectangles, and fill with a few pieces of bittersweet chocolate, some apricot jam, savory items like Gruyere cheese and sauteed spinach, or (our favorite) a combination of almond paste, butter, and sugar (I beat 1 and 1/2 ounces almond paste with 3/4 ounces butter and 1 tablespoon sugar until creamy and smooth to fill 3 rectangular croissants). 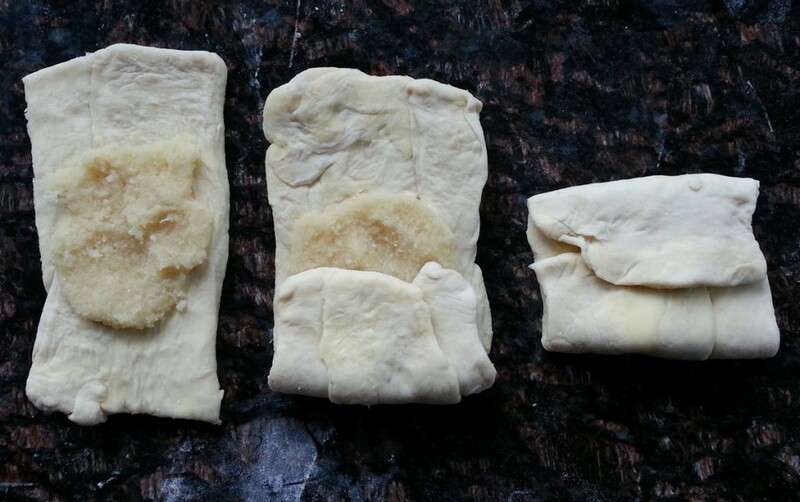 Spread the filling of choice on the dough, leaving a wide border all around, and wrap to enclose in thirds. Place seam side down on a parchment paper-lined baking sheet, then proceed as above for glazing with egg wash twice and baking. I don’t know if you ever heard of einkorn. If you haven’t, you aren’t alone: most people have no idea what it is. Despite its name, it isn’t a variety of corn. It’s actually thought to be the oldest form of wheat, and supposedly has never been hybridized like modern wheat. Einkorn means “one grain” in German, because it has only one grain per stem, while other varieties of wheat have several groups of grain. 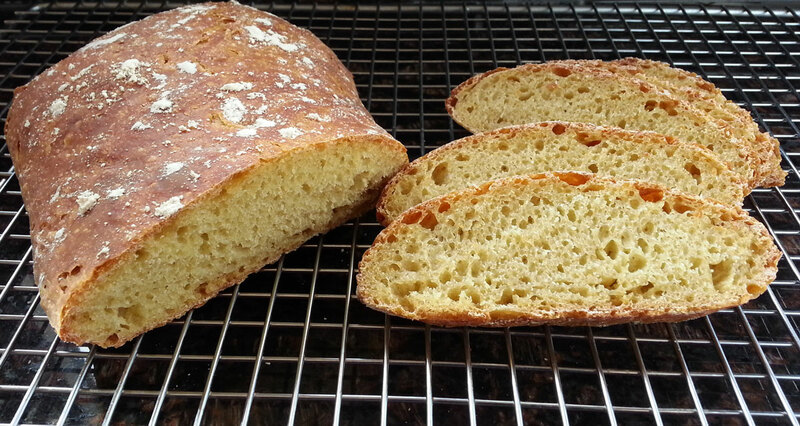 I first heard of einkorn a few years ago, when I was researching farro. Einkorn is one of three main types of farro wheat, called farro piccolo (little farro) in Italian. It grows well in hardy climates, and has a much higher vitamin and nutrient content than modern wheat varieties. 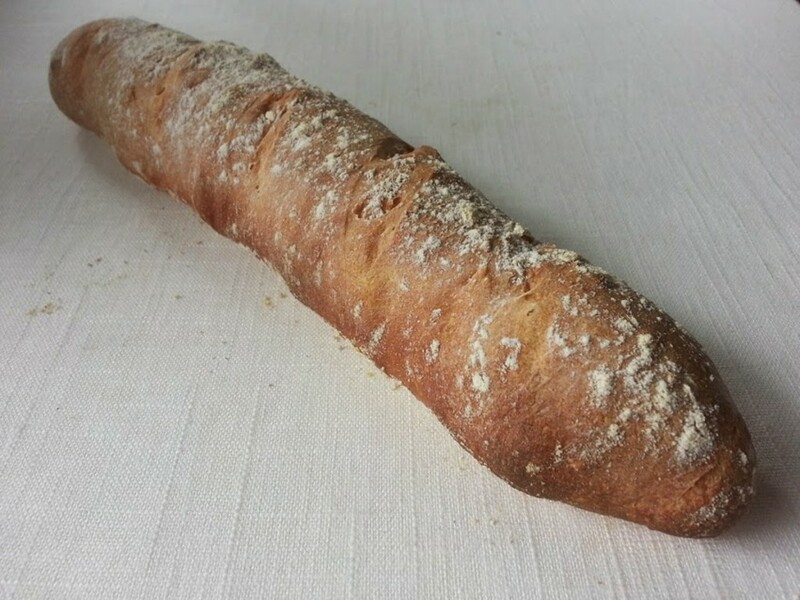 While it contains gluten, and is actually higher in protein than even bread flour (around 20% protein content as opposed to around 14%), einkorn may contain a type of gluten that some people with gluten intolerance can digest more easily. However, it was close to extinction until a few years ago, because harvesting and milling is much harder and more costly, and the yield is far lower, than with modern wheat varieties. Since I love baking bread (if I could, I would bake every day… but being a family of just two, there is only so much bread we can consume! 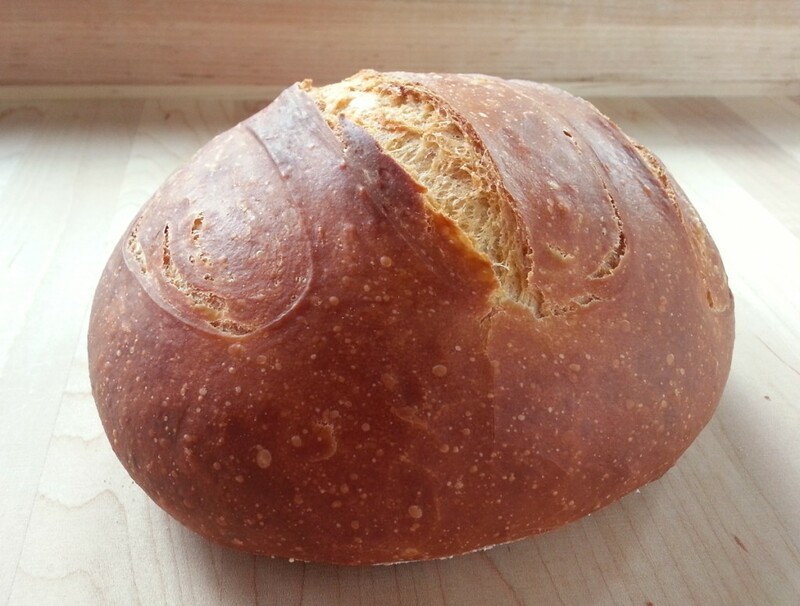 ), I was intrigued at the prospect of baking with einkorn flour. Would the bread taste significantly different? Would it rise as well, or be leaden and heavy, like many undoctored whole wheat breads can be? 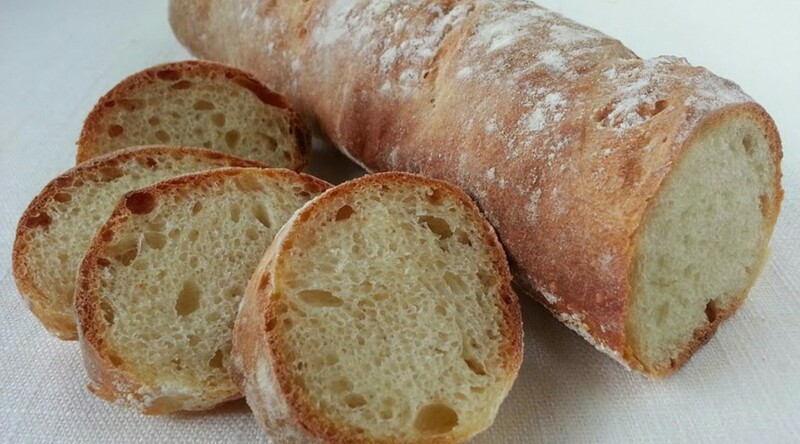 I didn’t want to add more yeast than usual to make it rise higher, as an abundance of yeast gives bread an artificial taste and an overly light crumb. I didn’t want to add vital wheat gluten. I didn’t want to add sugar or fat or anything other than what I usually put in my bread dough: just flour, yeast, salt, and water. 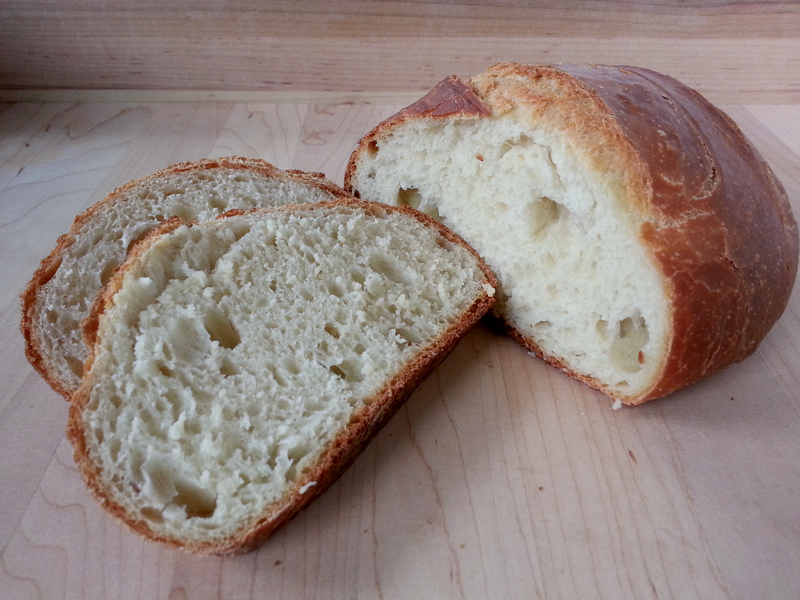 This way, I figured, I would really taste the difference between einkorn bread and bread made with modern wheat. 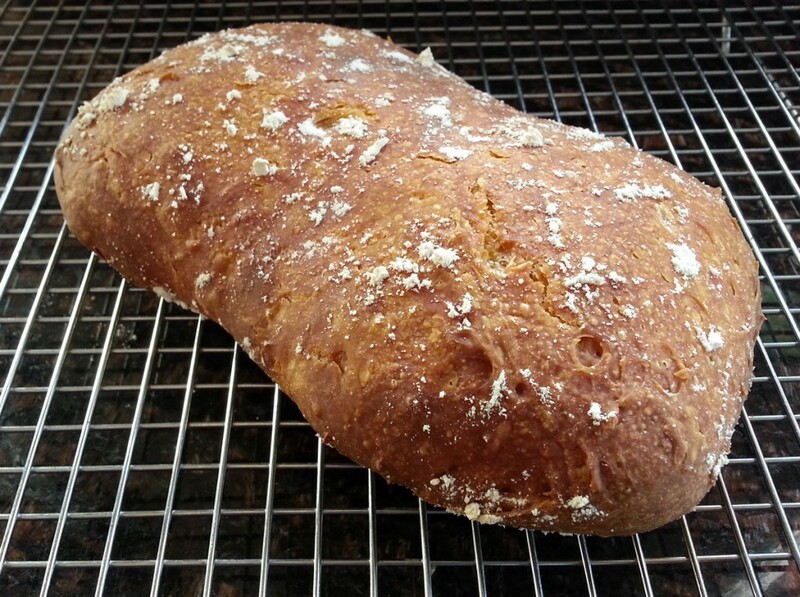 So last week, I baked my first batch of einkorn bread, using flour I picked up at my local market. (You can buy the flour as well as the whole berries from Jovial, the world’s largest producer of einkorn, online.) Since the gluten in einkorn is apparently not activated by kneading, I skipped the kneading step and simply stirred the dough a minute or two, then let it rise overnight at cool room temperature (if your kitchen is warm, refrigerate the dough). The bread rose very, very slowly at first, then picked up speed in the last few hours of rising. I took care not to deflate its air bubbles in the final stage of shaping, and let it rise again before slipping it into a moderately hot oven, and it emerged golden and fragrant 40 minutes later. The result: Delicious, wheaty, sweet, moist, definitely worth repeating. It didn’t rise as much as bread made with modern wheat, but it had a pleasant chewiness and staled far more slowly than modern wheat bread: in fact, it was still good the next day (I propped it on its cut side so no air would compromise the open crumb). Try the recipe below; it’s easy and rewarding, and you’ll be helping a grain once vital to humanity to flourish once again. Place the flour, yeast, and salt in a large bowl. Mix well with a wooden spoon. Add the water slowly, stirring constantly. When all the water has been absorbed, determine if you need to add a little more water or not; einkorn flour absorbs water more slowly, and doughs made with einkorn should be somewhat sticky if the bread is to bake up light rather than heavy. The dough should feel sticky when touched, but not like a batter. When you are satisfied with the texture of the dough, stir it a minute or two. Then cover the bowl with plastic wrap, and place a plate on top of plastic wrap to prevent light from filtering through (the bread can develop an orange hue if the dough is exposed to light, due to the high amount of carotenoids in the flour; carotenoids are very good for us, as they are anti-oxidants, so the high amount of carotenoids is another good thing about einkorn). Set aside to rise for 12 hours. Uncover, and gently deflate and reshape the dough to redistribute the yeast (this helps bread dough to rise better). Cover again with the plastic wrap and the plate, and let rise again until doubled, about 12 more hours. When you are ready to bake, place a baking stone on the bottom rack of the oven and preheat the oven to 350 degrees (preferably set on convection bake). Line an upturned baking sheet with parchment paper and dust it with cornmeal. Sprinkle your counter with cornmeal. Gently turn the dough onto the cornmeal without deflating it. Gently tug into a long rectangle, about 10 inches long by 4 inches wide; if the dough is sticking to your hands, wet your hands as you would if you were handling meatballs. Place on the cornmeal dusted parchment paper atop the upturned baking sheet and dust the top with flour. Cover with plastic wrap and let rise 1 hour. Uncover (the plastic wrap may have stuck here and there). Dust the top again with a bit of flour for a rustic look. Transfer to the baking stone using the baking sheet as a peel (don’t bake the bread on the baking sheet though, just on the parchment paper). Spray 3 times with water during the first 10 minutes of baking. Bake for a total of 35 to 45 minutes, or until the bread is richly golden. The bread should sound hollow when thumped on the bottom. Cool on a rack, removing the parchment paper first to allow air to circulate from the bottom and prevent the bottom crust from getting soggy. Cool completely before slicing. 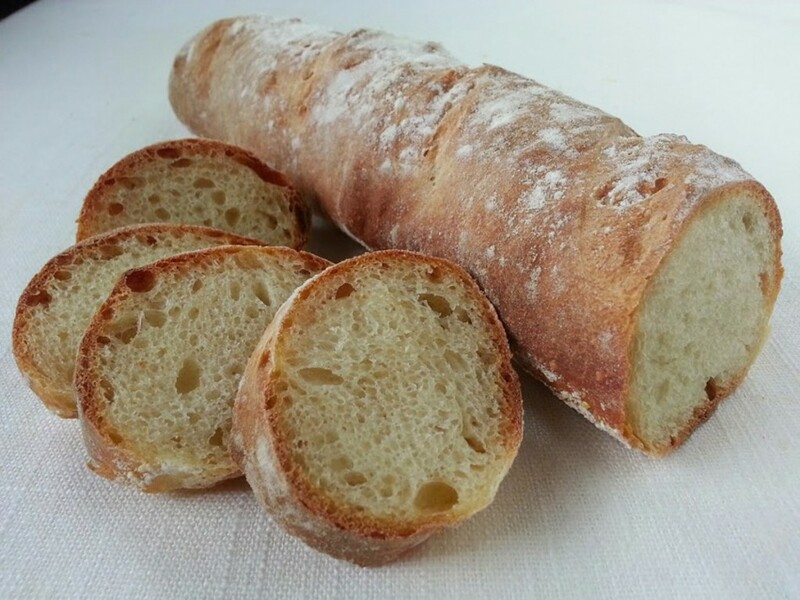 This bread is excellent spread with raw honey! 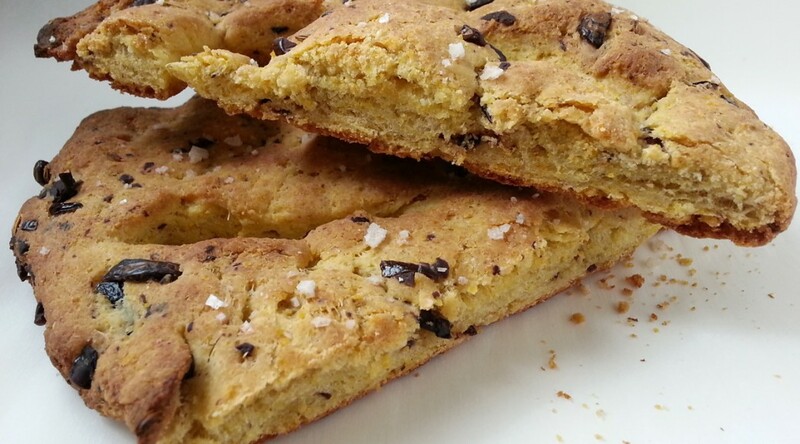 Fougasse is a ladder-shaped bread from Provence, similar in many ways to focaccia (even the name hints at shared roots). You can make fougasse with any type of yeasted dough; pizza dough or a simple bread dough enriched with olive oil work very well. 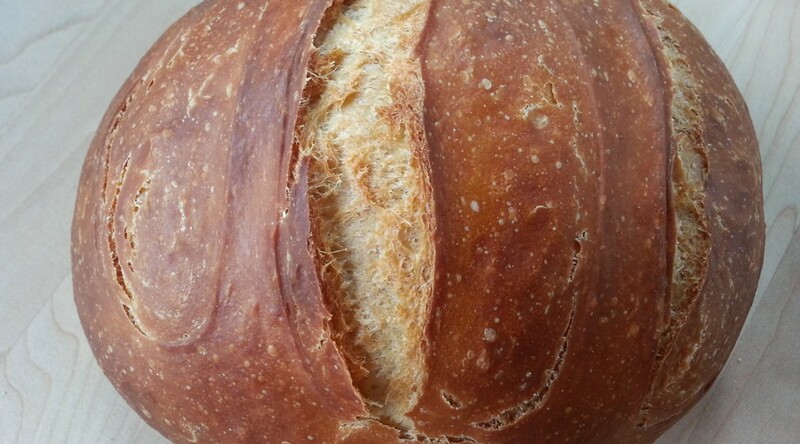 It’s all about the shaping: several slits are cut into the dough after the second rising, so the bread bakes up crispier than usual thanks to the additional exposed edges. My favorite fougasse includes fresh herbs such as thyme or rosemary. Lately I have been adding polenta to the dough, a nod to the cornmeal doughs made in Calabria and Abruzzo, which are typically baked until quite crisp and served floating in thick vegetable soups or passed alongside savory cheeses and salumi. 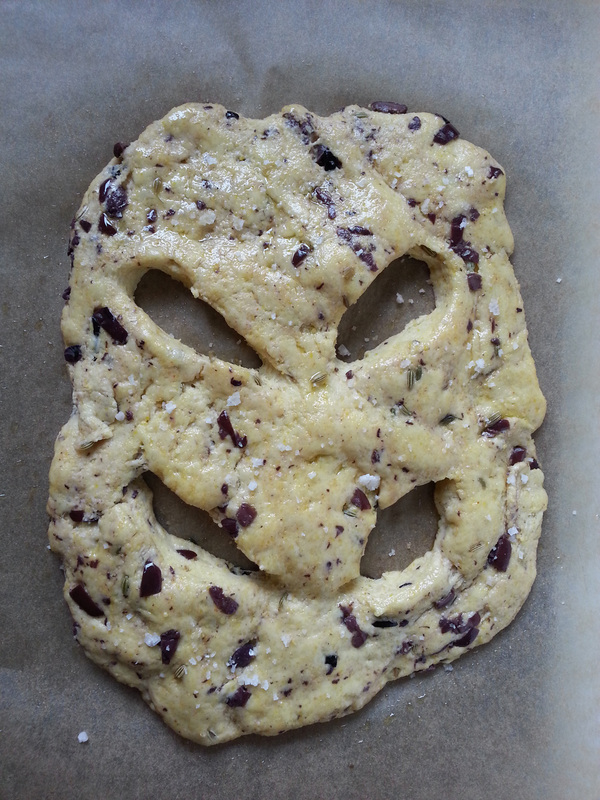 Adding minced black olives to the dough gives it an addictively salty bite; you can omit the olives for a sweeter, more neutral taste and lighter color. 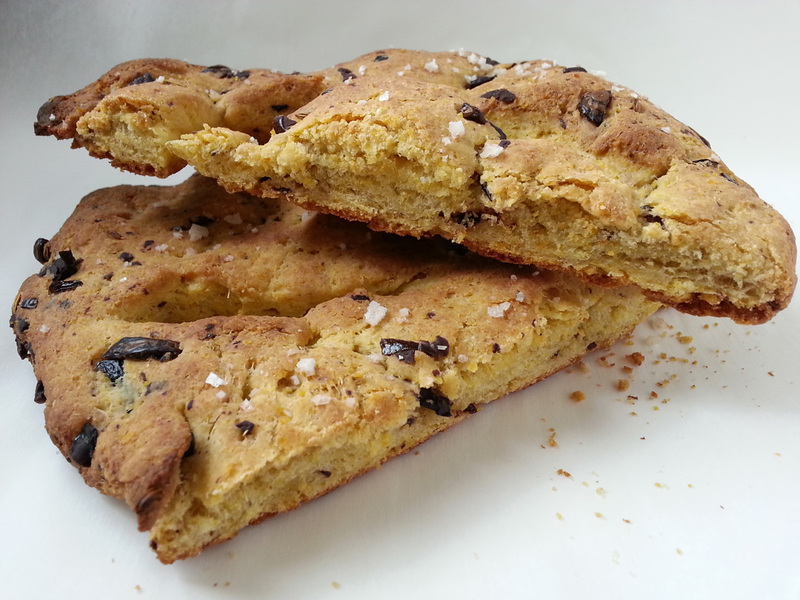 The bulk of this dough is polenta, with just a little wheat flour to provide gluten and lift, so the fougasse bakes up crispy outside and a bit dense and cakey on the inside. 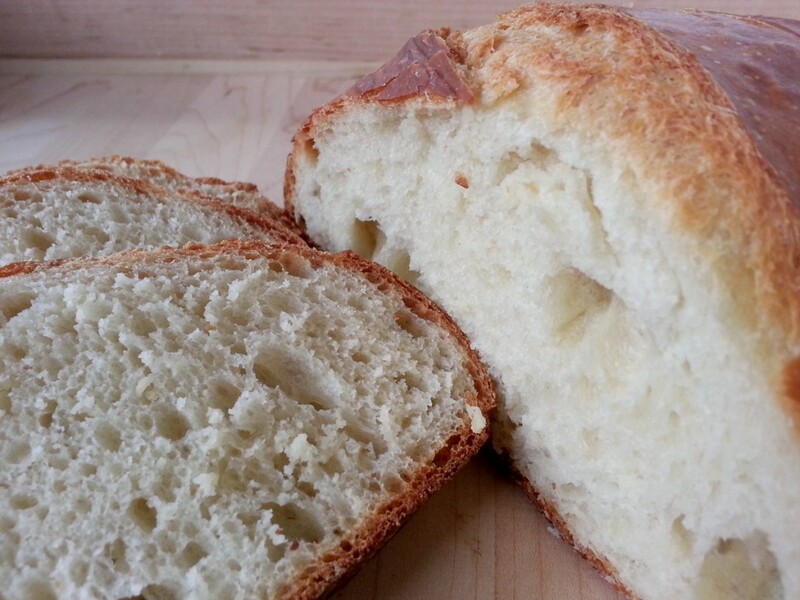 It tastes like an old-fashioned bread should: hearty, rustic, and full of character. Make the dough: Place the cornmeal, flour, yeast, and salt in a large bowl. Mix well with a wooden spoon. Add the olives and olive oil, and mix again. Pour in the water, adding enough to make a soft dough that gathers around the spoon. Add a little more water if the dough is dry or a touch of all-purpose flour if it is sticky. Turn out onto a lightly floured counter and knead for 10 minutes, or until smooth and silky and elastic. It is fine if the dough sticks a little bit to the counter; the faster you knead it, the less it will stick; and the less it sticks, the less flour you will add, resulting in a lighter fougasse once baked. A few hours before you are ready to bake, remove the dough from the refrigerator, place it on a very lightly floured counter, and knead it a few times. Return it to the bowl and cover again with the plastic wrap. 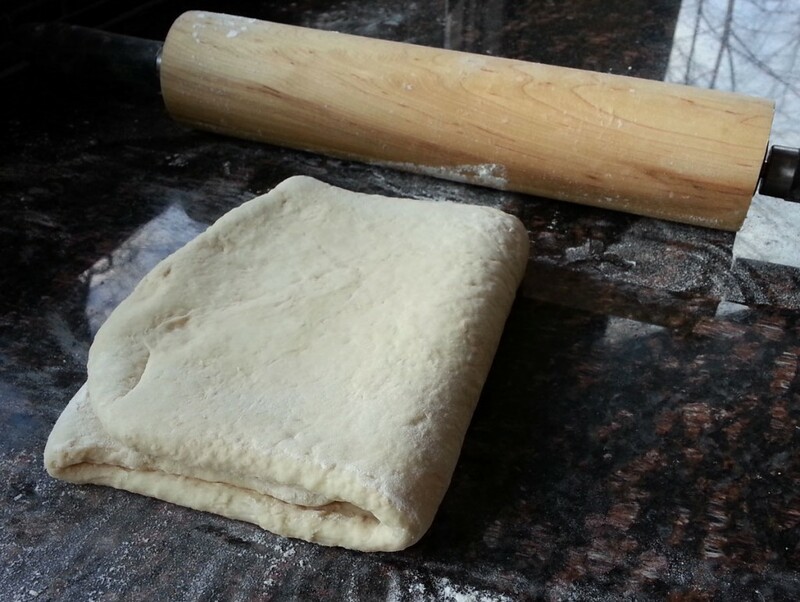 Turn the dough out onto a very lightly floured counter and stretch it into a 12-inch long by 6-inch wide rectangle. Transfer to a piece of parchment paper. Place the parchment paper on an upturned baking sheet. Cover with plastic wrap and let rest 30 minutes, or until starting to puff a bit. 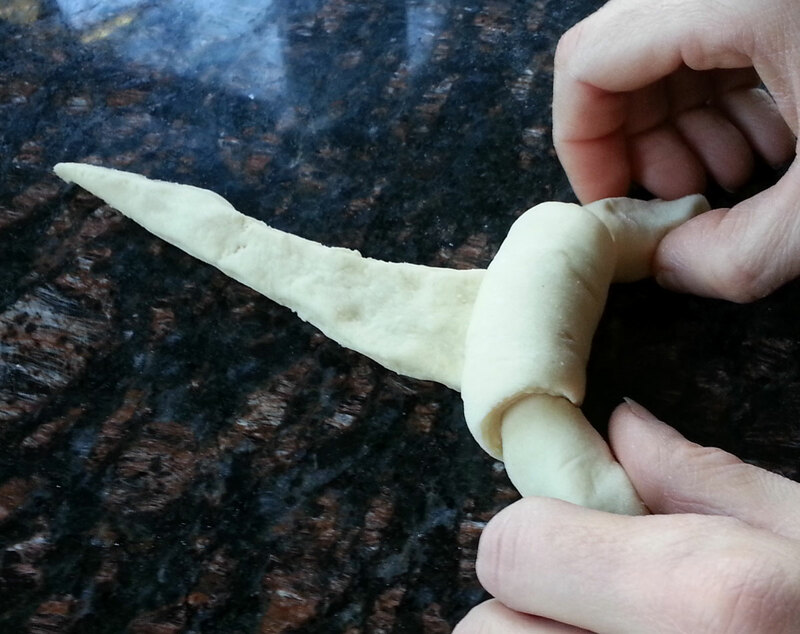 Using scissors, cut decorative slits into the dough, creating a ladder shape. Stretch each aperture created by each slit with your fingers so there is more crust exposed. To bake: In a bowl, whisk together the olive oil and water. Brush over the fougasse. Sprinkle with the coarse salt. Slip the fougasse (still on the parchment paper) onto the hot baking stone, using the upturned baking sheet like a pizza paddle to push off the parchment paper. Immediately close the oven door. Bake on the baking stone in the preheated oven for 20 minutes, or until golden brown all over and crispy around the edges, spraying the oven floor with ¼ cup of water 3 times during the first 10 minutes of baking. To serve: Cool on a rack 10 minutes, brush with the olive oil, and cut into wedges before serving.